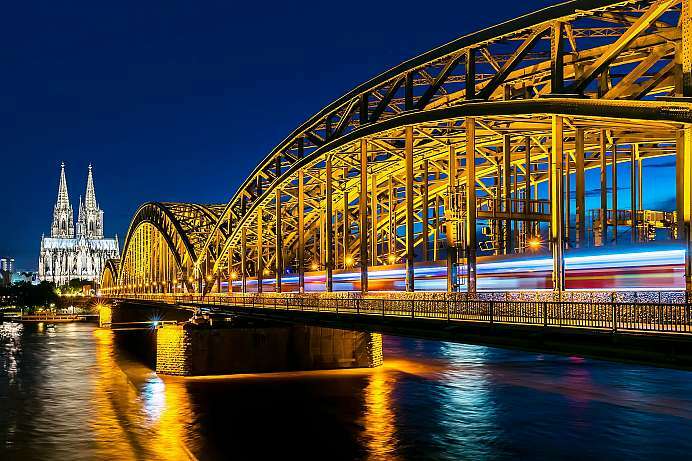 The political and cultural capital of Saxony has an eventful history. Although already mentioned in 1206, it was largely insignificant until the 15th century. After it survived the 30-year war, it burned to the ground in 1685. The city of the Saxon Elector was then rebuilt in glorious fashion and given a uniform baroque townscape which earned her the name “Florence of the North”. In February 1945 the hitherto scarcely damaged city was razed to the ground in one night by a devastating bomb attack. For decades the ruins of the Frauenkirche were a memorial to the horrors of war. 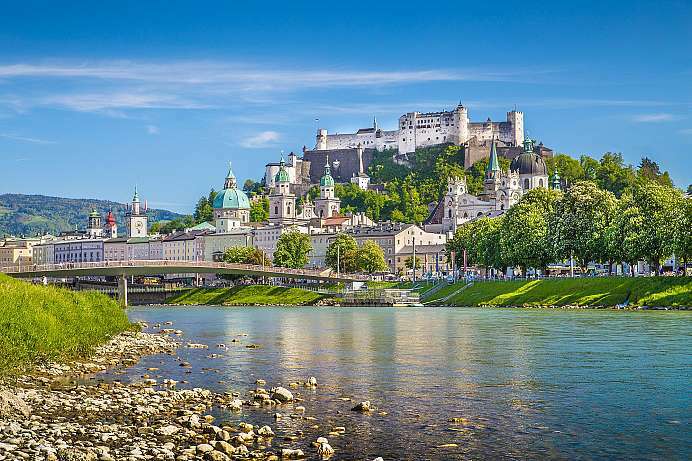 The glorious restoration of the Frauenkirche in 2005 unleashed the ambition of the city to reconnect with its former splendor and beauty before the 2nd World War. 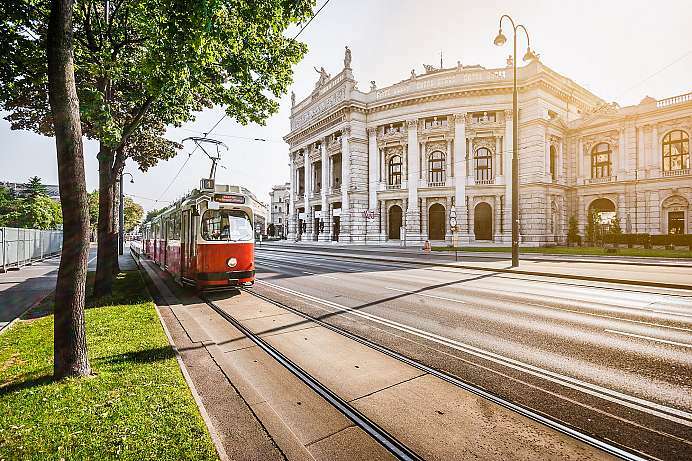 The old town between the Zwinger (palace) and Kreuzkirche (Church of the Holy Cross) has been restored to its former glory and many other sites in the city are being rebuilt. Around the end of the 19th century, the farmer Paul Pfund and his wife traveled to Dresden with their six cows in order to sell milk there. In 1880, Pfund founded the Dresden Molkerei Gebrüder Pfund, which grew into a flourishing company. The heart of the company is its dairy store on the ground floor. 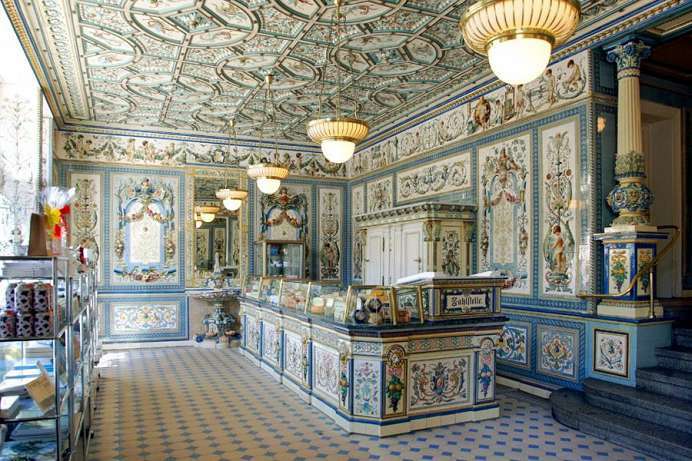 With its hand-painted tiles from Villeroy & Boch, it looks like something straight out of a picture book. The creamery even made it into the Guinness Book of World Records in 1998. In addition to milk, you can buy special cheeses here made from goat and sheep milk. 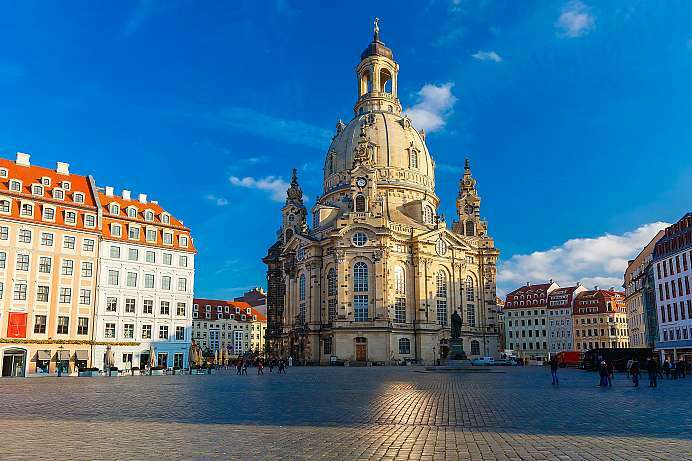 The heart and tourist magnet of Dresden is the rebuilt Frauenkirche in the centre of the old town. The monumental Protestant church building is the old and new landmark of the city. Built between 1726 and 1743, destroyed on 13 and 14 February 1945, it has been rebuilt since the 1990s with the help of a large amount of donations. In 2005 the new consecration took place. Also the place at the church, the Neumarkt, was reconstructed. After the Second World War, the most important inner-city square next to the Altmarkt with the symbolic ruins of the Frauenkirche remained almost untouched for half a century. Then a lively building activity set in, quarter by quarter the typical baroque gabled houses were rebuilt. Behind the Residenzschloss the procession of princes connects the Neumarkt with the Schlossplatz. 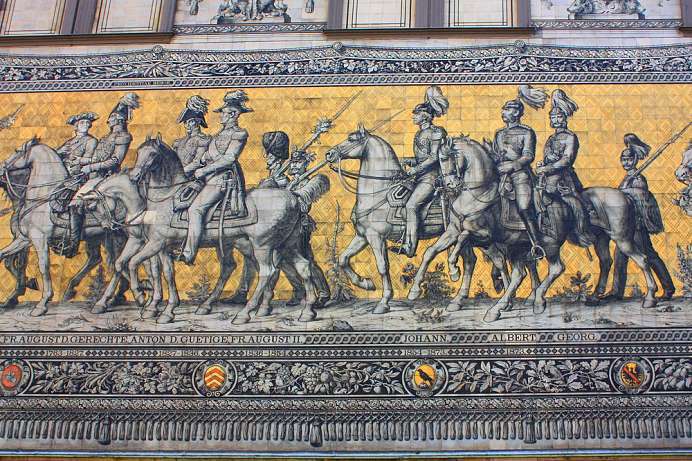 The rulers of the House of Wettin are depicted as a cavalcade on a 100 meter long mural made of Meissen porcelain tiles. Between 1872 and 1876 the gigantic work of art was painted. However, the colors on the outer wall quickly faded and the pictures were transferred to porcelain tiles. This required 24,000 individual tiles. The Renaissance building was first erected in the late 15th century as the new power centre of the Saxon electors and kings and was rebuilt after a fire in 1701 under August the Strong. 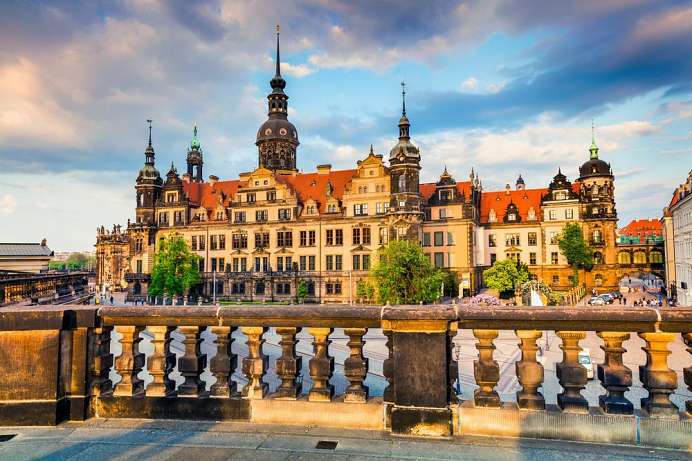 After its destruction in the Second World War, it was reconstructed in 1985 as a museum complex of the Dresden State Art Collections. Since then the castle has housed the Historical and the New Green Vaults, the Kupferstich-Kabinett, the Rüstkammer with the Turkish Chamber and the Münzkabinett.